"Woo-pecker," he states pointing out the window. 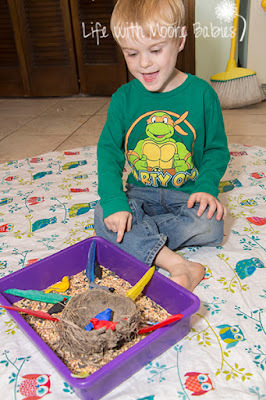 Not only did he recognize woodpeckers as a toddler, but it was great fun to hear him say, "woo-pecker eat bugs." Now nearly 5, this boy recognizes more birds than I knew even last year. We have learned so many together. And yes, my boy still loves his birds. In fact, his love of birds inspired me to create this Songbird Sensory Bin! 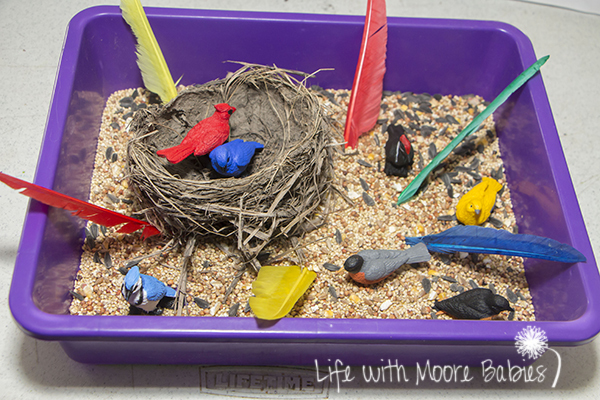 To put this bird themed sensory bin together, I started out with a Toob of Backyard Birds which gave me several birds that are common enough in our area that we have seen them as well as a few we are still watching for. 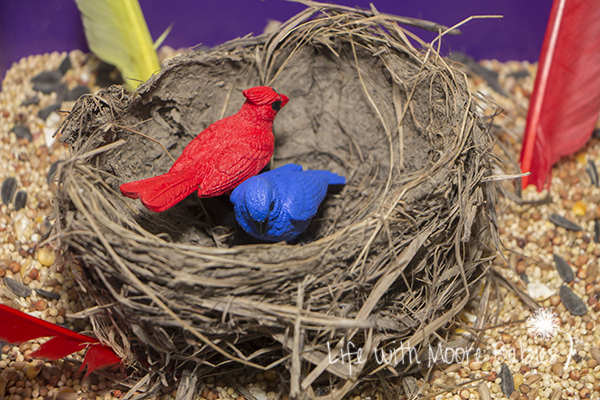 The next thing I added was an old nest; not really something you can buy, but I you could make something similar with grass and clay in a nest shape or maybe even a paper bag. Luckily, living with pack rats paid off this time! The girls had found this nest after a wind storm last fall, and they squirreled it away in their playhouse with cicada shells, rocks, and the random dead dragonfly they found. 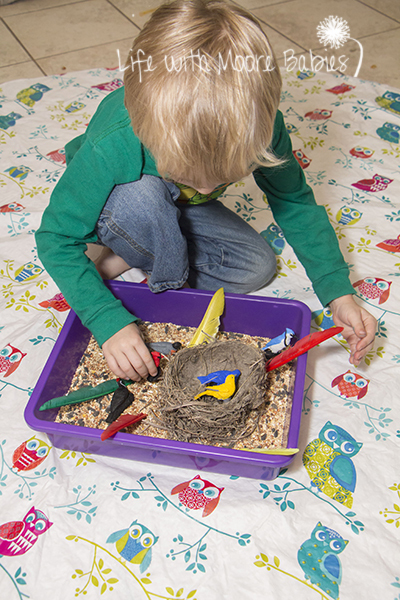 For a bird themed sensory filler I chose bird seed. While not all of the birds in our Toob eat bird seed, many do, in fact that is how we have seen many of them, around our feeder. 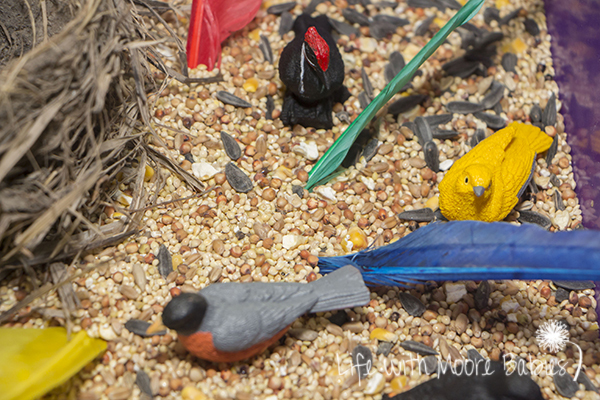 To add a little extra bird sensory fun, I added some feathers! More natural feathers would have been nice, but all I had were colorful craft feathers. The colored feathers did add some visual interest plus a different texture! 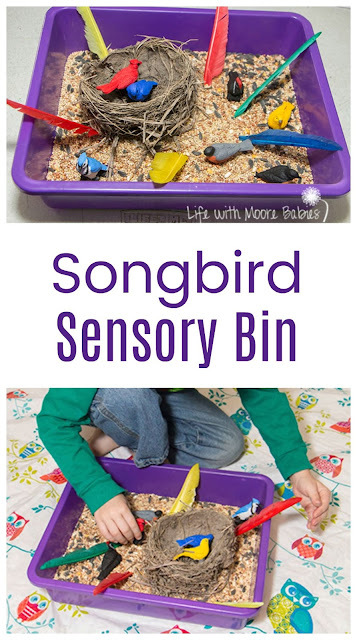 Let me tell you, this little guy was jumping up and down and cheering when I handed over his songbird themed sensory bin! 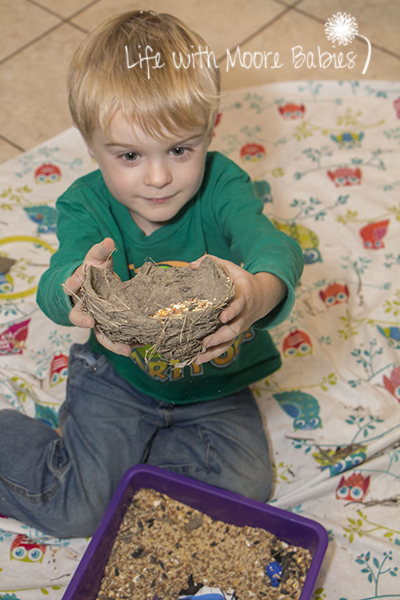 He stuffed all the birds in the nest. He fed all the birds birdseed. 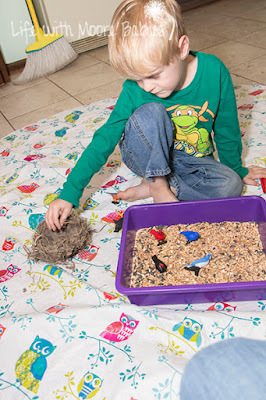 He took the nest out and flew all the songbirds back and forth in order to get their food. Then he decided to use the nest as a scoop for the birdseed. After about a week of play, the little nest started to fall apart as would be expected. The little birds stayed out though. We printed out little cards that match the songbirds from Every Star is Different to continue learning about these birds, and hopefully, we get a chance to see and learn about more of them together! For a fun bird related snack check out our Edible Bird's Nests!